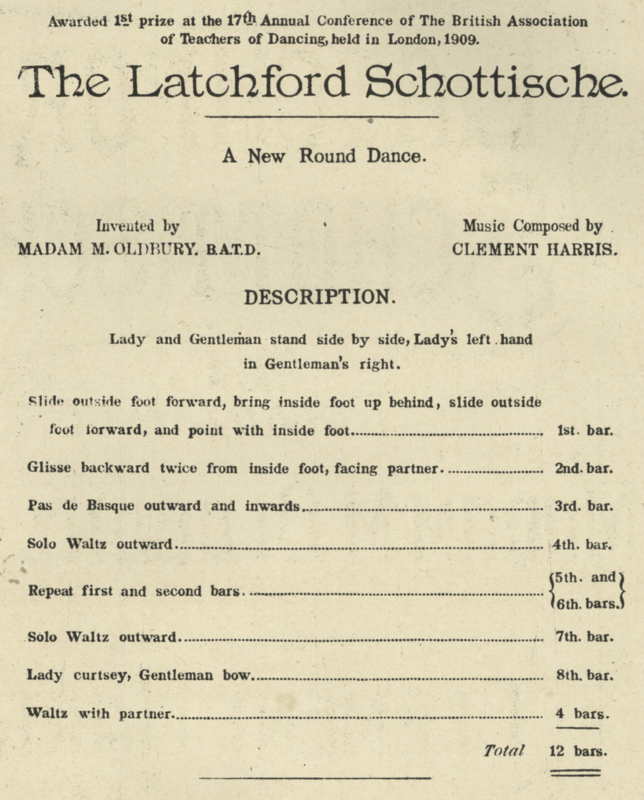 This is an easy English sequence schottische (or slow two-step) composed by Madam M. Oldbury in 1909. Both facing LOD, holding inside hands. Part I - Advance and Retreat (2 bars): Step forward (1), close (2), forward (3), and point inside foot forward (4) along LOD. Then step side (1), close (2), side (3), and close without weight (4) against LOD. Part II - Pas de Basque and Rollaway (2 bars): Both facing LOD, pas de basque away from each other (1 & 2), and toward each other (3 & 4). Then rollaway with a full outward two-step along LOD (5 & 6, 7 & 8). Part III - Advance and Retreat (2 bars): Repeat Part I. Part IV - Rollaway and Honor (2 bars): Rollaway with a full outward two-step along LOD (1 & 2, 3 & 4). Then honor partner with a bow and curtsey (5, 6, 7, 8). Parts V through VIII - Waltz (8 bars): As a couple, waltz eight bars (eight full turns). Madam M. Oldbury (dance), Clement Harris (music). (1909). 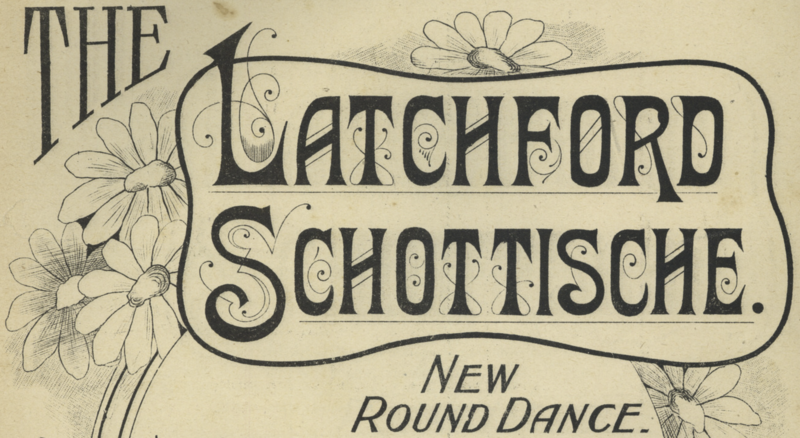 The Latchford Schottische. London.